If you are seeking alternatives to spinal fusion you probably have years of medical care behind you. Your case has become “complicated,” “difficult to treat,” your medication consumption may have increased dramatically as your situation degenerates rapidly. You have spent a lot of time online looking for answers including the time you spend here with us reading this article. We are going to present a lot of information in this article. This information comes from 26 plus years experience in helping people avoid spinal fusion surgery, our own published research in the medical journals, and the research from surgeons at leading medical universities and hospitals. We hope this information will help you in your journey in finding pain relief and the ability to enhance and increase your quality of life. You do not want a “significant and major spinal surgery.” In fact, you would not be here on this page if you were completely sold on your doctor’s recommendation to discectomy or spinal fusion. You do know that people do get benefit from major spinal surgery and are able to rebuild their lives, you have also done a lot of research which shows you that spinal fusion or discectomy can make things a lot worse. But how do you manage a burning pain, and not just any burning pain, but an occasional hot branding type pain that travels from your low back into your hips and for some down your legs into your toes? How do you manage not being able to walk a few steps, not being able to stand for 20 minutes and not being able to sit for more than 15 minutes? You have had nerve blocks, maybe nerve blocks on multiple occasions because the pain returned after a brief respite. Physical therapy helped you somewhat. AT least it made you feel like you were doing something positive. But the pain returned. You may have had a Minimally invasive spinal surgery that brought you some success, partial if not whole symptom relief. This may have lasted for months. And then one day the pain came back. This time the nerve blocks did not work. What happened? Your spine became unstable again. The surgery did not bring sustainable relief. We do not like spinal fusion surgery. We don’t like it because it does not correct the underlying problems of spinal instability as many people would think it would. In fact, spinal fusion surgery may increase spinal instability and degeneration. How can this be? Because the surgery was performed with the idea that it was the discs were causing the person’s problems. The surgery failed because it was not the discs by themselves, but spinal instability caused by weakened degenerated ligaments. For many people we see, the missing diagnosis, the missing treatment was the one one that addressed your damaged spinal ligaments. A teaching point of this article: Understanding what degenerative spinal instability is and how surgery may not be the best option. Throughout this article we are going to present research from leading medical centers and universities. We do this so that you will see the contents of this article are not just our opinion. Our opinions are shared by others in the medical community. In the April 2018 edition of the medical journal Insights Imaging (1) doctors from Mercy Catholic Medical Center published a paper entitled the “ABCs of the degenerative spine.” This paper was written for the benefit of radiology residents. What is so fascinating about this very detailed paper is that the authors set out to tell the residents that they need to recognize that degenerative disc disease is far from only a problem of the disc. That the disc itself sits within a complete spinal unit that consists of the adjacent vertebrae, the intervertebral disc itself, the spinal ligaments and the facet joints. Further, degenerative disc disease is not really a degenerative disease but the result of continued insults (injuries) that makes the disc vulnerable to flattening out. We like to call these “insults” or injuries, the excessive load and destructive joint forces caused by damaged, weakened spinal ligaments. This is explained further below. Later in this article we will discuss the role of spinal ligaments in maintaining spinal strength and pain-free movement. It is very likely that if you are reading this article and are contemplating spinal surgery, the role, function, and repair of spinal ligaments HAVE NOT been discussed with you at all. Let’s talk surgery first. Patients who have a case review by a team of spinal pain specialists, including physiatrists, anesthesiologists, pain specialists, neurosurgeons, orthopaedic spine surgeons, physical therapists, and nursing staff, and are counseled in the findings of that review, will likely decline to have the surgery. This is a very interesting study for the patient with concerns and fears of what spinal fusion surgery can offer them. So let’s break it down a little bit. The paper sought to establish a comparison between getting guidance from a multi-discipline and diverse group of health care professionals as opposed to only getting guidance from a surgeon in whether or not they should proceed with spinal fusion. What is highlighted is the fact that the patients in this study had ALREADY suffered from a complex spinal history or PRIOR spinal surgery. 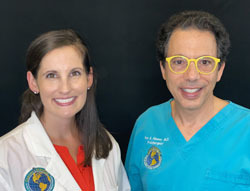 In their review and counseling, patients’ were involved in discussions about deciding on surgery, the type of surgery, and to see if they were good candidates for that particular surgery. Of these, 100 patients had been recommended for lumbar spine fusion by a surgeon. Nonoperative management in 58 patients (58%) who had been previously recommended for spinal fusion at another institution. Research is addressing the problem that patients DO NOT understand what is causing their back pain and rely too much on the surgical interpretation of MRI to give the go-ahead to fusion surgery. If patients have information, they are more likely NOT to have spinal fusion surgery. In October of 2018, another study confirmed the findings we shared above. In this new research, doctors at the VA Maryland Health Care System and the University of Maryland School of Medicine (3) offered these observations after they established a “multidisciplinary spine board” to review candidates selected for elective lumbar spine surgery. The board comprised representatives from orthopedic spine surgery, neurosurgery, psychology, physical therapy, radiology, pharmacy, primary care, pain management, anesthesiology, and veteran advocacy. Between March 1, 2016 and December 30, 2016, the spine board itself discussed 11 patients. All patients underwent clinical examinations and radiological assessments findings that warranted elective lumbar surgery. The board recommended non-surgical interventions before proceeding with the planned surgeries in all cases. The board stopped or delayed 11 or 11 surgeries. The doctors noted that before they had a “Spine Board,” a total of 101 elective lumbar spine surgeries were performed. After the establishment of a spine board, a total of 51 elective lumbar spine surgeries were performed. The surgical plan for elective lumbar spine surgery in the post-implementation period was not directly influenced by the review of spine board because none of the cases were discussed in the conferences; however, the care occurred at a hospital where the spine board was implemented. As we discussed in the research above, if patients have information, they are more likely NOT to have spinal fusion surgery. But what if they were given a piece of information that, by itself, suggested a fusion may be necessary? What if that information was not corroborated? Then you have symptom-free patients heading for surgery. Spondylolisthesis (Slipped disc), Spondylolysis ( stress fractures from wear and tear), Spondylosis (arthritis wear and tear of the discs). These are sometimes confusing terms that act as a catch all phrase or umbrella term to describe neurological or degenerative or inflammatory disorders caused by spinal defects which can occur in the cervical, thoracic, and lumbar regions. The terms can also be linked to degrees of severity such as mild or moderate or advanced spondylosis or severe spondylosis that can cause local or diffuse pain. Sometimes everything is just thrown into one term spondylotic. It is sometimes difficult for them to understand all these definitions. When patients do not understand the options they opt for surgery. In a recent study from doctors at Wayne State University School of Medicine appearing in the Journal of Neurosurgery, (4) patients referred to a neurosurgery clinic for degenerative spinal disorders were surveyed to determine their understanding of lumbar spondylosis diagnosis and treatment. The survey consisted of questions designed to assess patient understanding of the role of radiological imaging (MRI for low back pain) in the diagnosis and treatment of low-back and leg pain, and patient perception of the indications for surgical compared with conservative management. A total of 121 surveys were included in the analysis. more than 40% of patients indicated the same for plain radiographs. Similarly, a large proportion of patients (33%) believed that back surgery was more effective than physical therapy in the treatment of back pain without leg pain. Nearly one-fifth of the survey group (17%) also believed that back injections were riskier than back surgery. These results show that a surprisingly high percentage of patients have misconceptions regarding the diagnosis and treatment of lumbar spondylosis, and that these misconceptions persist in patients with a history of spinal surgery. Specifically, patients overemphasize the value of radiological studies and have mixed perceptions of the relative risk and effectiveness of surgical intervention compared with more conservative management. These misconceptions have the potential to alter patient expectations and decrease satisfaction, which could negatively impact patient outcomes and subjective valuations of physician performance. While these results are preliminary, they highlight a need for improved communication and patient education during surgical consultation for degenerative lumbar spondylosis. Are you a good candidate for spinal fusion? The two studies cited above suggest that you are a good candidate if you sought many medical options about your spinal fusion, especially if you already have complicated back issues from previous spinal surgery. They also suggest that you are a good candidate if you do not believe everything the MRI is showing you. However, are there more considerations to take into account if you are exploring spinal fusion surgery? So are you a good candidate for spinal fusion? Yes if . . .
and have been prepared for a long rehabilitation period with a compromised quality of life . . . then you are a good candidate for a surgery recommendation that is unclear and imprecise. “(Spinal fusion is an) operation that welds together adjacent vertebrae to relieve back pain from worn-out discs. Unlike most operations, it actually was tested in four clinical trials. The conclusion: Surgery was no better than alternative nonsurgical treatments, like supervised exercise and therapy to help patients deal with their fear of back pain. In both groups, the pain usually diminished or went away. It is unclear if a decade of clinical trials saying spinal fusion is no better than conservative treatments and one New York Times article will change anything, spinal fusion surgery will still be done. Why? Because the MRI will always show clear evidence of the need for medical intervention. Leading neurologists and spinal surgeons in Norway and Sweden published their research in the Scandinavian journal of pain (published in the United States) in July 2017. The paper entitled: Symptoms and signs possibly indicating segmental, discogenic pain. A fusion study with 18 years of follow-up, followed patients who had spinal fusion over an 18 year period. Only two of these five existing randomized studies have reported better results from fusion surgery for chronic low back pain compared to conservative treatment. In these studies, the back symptoms of the patients were described simply as “chronic low back pain.” One possible reason for the modest results of surgery is the lack of a description of specified symptoms that might be related to a painful segment/disc, and patient selection may, therefore, be more or less a matter of chance. Conservative care treatments provided better results than spinal fusion. Remarkably, pre-screening presently offered did not help predict who would benefit from surgery and who would not. The purpose of this paper was to help identify which patients spinal fusion may help. In its conclusion, the researchers found patients with midline back pain and acute pain on sudden movement may benefit most. Results were not conclusive. I want to point out that this research was led by renowned spinal surgery researchers Bo Nystrom of the Clinic of Spinal Surgery in Sweden. Among his many studies, Nystrom led a team of researchers that writing in The Open Orthopaedics journal (7) suggested that if MRI showed what was really causing back pain, lumbar fusion would have worked. Here is a remarkable finding from that research on lumbar fusion success or non-success. The three studies cited above suggest to patients the many complexities of spinal fusion surgery. All of them discuss the quality of life in patients for whom there were complications causing post-surgical pain. Now here is a fourth study that brings in a more detailed analysis of the need for painkillers after the spinal fusion. In research from the medical journal Spine, (8) doctors looked at Worker’s Compensation patients who were given Lumbar Fusion Surgery for Degenerative Disc Disease. What they wanted to measure was how much painkiller medication they were on, if any, and what was the effect. One thousand and two patients participated who had a lumbar fusion from 1993-2013. Postoperative use of chronic opioid therapy (chronic use of painkillers) was defined as being prescribed the medications for more than one year after the 6 week acute period following fusion. Of the 1002 patients (57%) or 575 patients took the pain medications for more than one year following surgery. had extended work loss before fusion 61.3%. Within 3 years after fusion, the chronic opioid therapy group was supplied with an average of 1083.4 days of opioids and 49.0 opioid prescriptions, 86.2% of which were Schedule II. Examples of Schedule II narcotics include hydromorphone (Dilaudid®), methadone (Dolophine®), meperidine (Demerol®), oxycodone (OxyContin®, Percocet®), and fentanyl (Sublimaze®, Duragesic®). Other Schedule II narcotics include morphine, opium, codeine, and hydrocodone. Please refer to our articles How narcotic pain medications can increase chronic pain, Why chronic non-steroidal anti-inflammatory drug (NSAIDs) usage can make pain worse. In the research above, studies centered on patients who already had spinal surgery that resulted in a “complex history of prior spinal surgery.” The causes of failure are many and complex. What the studies above point out is the need to try not to go back to another surgery. A study in the Global Spine Journal examined Pseudarthrosis (the non-union or non-healing of bones) following spinal fusion. To a doctor like myself, who sees many failed back surgery patients, it is not surprising that the researchers said the non-union or non-healing of bones remains a substantial problem. Current data shows that patients who develop a pseudarthrosis have suboptimal outcomes. (Some would call suboptimal, failure, or catastrophic failure of the spinal fusion). Bending over while standing increases the central pain. The many complexities of the spine and the spinal ligaments can be seen at the intervertebral joints – where vertebrae connect to each other. Here the interspinous ligament weaves between the spinous processes connecting the back of the vertebrae bony processes. The supraspinous ligament connects the spinous processes. Running towards the cervical spine it forms the nuchal ligament. The intertransverse ligaments connect the adjacent transverse processes, and the ligamentum flavum connects the laminae of adjoining vertebrae. 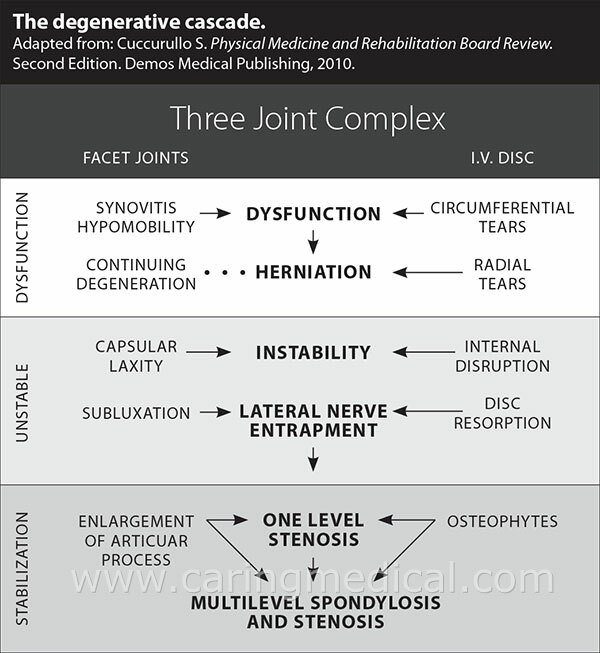 It should be clear that the spinal ligaments are key factors in spinal stability and instability which can lead to degenerative disc and possible nerve compression at the facet joints in flexion or extension, and at the lower back ligaments of the sacroiliac joints. In other words, back pain can be due to an unstable disc problem, facet joint locking, or sacroiliac dysfunction caused by problems of the spinal ligaments. The opening statement of a recent research article from doctors at the Mayo Clinic brings all these concerns together when the researchers state: “Understanding spinal kinematics (the movement of the spine) is essential for distinguishing between pathological conditions of spine disorders, which ultimately lead to low back pain. Is medical research suddenly discovering that the spinal ligaments are important, actually crucial in determining back pain problems? There is a recent cluster of research on understanding the spinal ligaments and their crucial role in healing degenerative disc disease. In one study doctors from Brigham Young University (13) even suggest that the ligaments may be the key to degenerative disc disease and spinal degenerative changes. The researchers suggest that it is hard for doctors and MRIs to figure out the pain sources in low back pain, and that even when people have it, there are no symptoms for it, yet eventually it will develop into worsening low back pain and disc problems. But, these researchers also say that there are “patterns” of disc degeneration that may provide insight into where the pain is coming from and that by addressing these patterns – further disc degeneration can be managed, What do doctors need to address? Spinal ligaments. 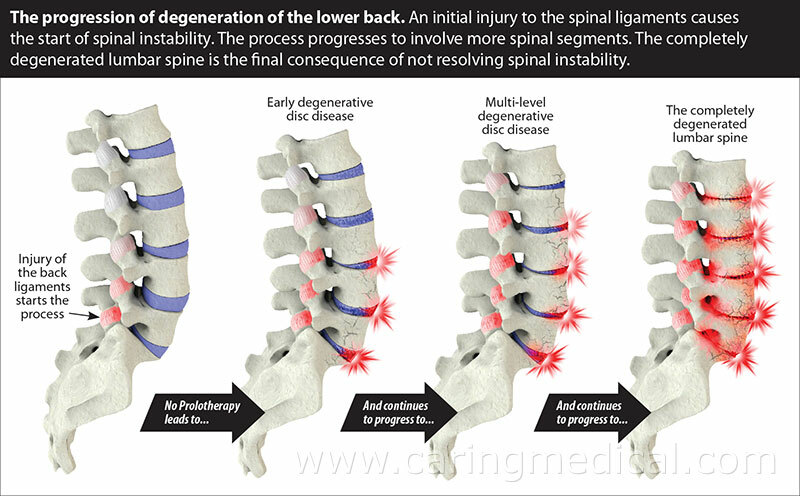 Specifically, individuals with contiguous multi-level disc degeneration have been shown to exhibit higher presence and severity of low back pain as compared to patients with skipped-level disc degeneration (i.e. healthy discs located in between degenerated discs). Here is the reason: Stresses on the surrounding ligaments, facets, and pedicles (the area of the vertebrae where many spinal procedures begin) at vertebral levels where there was no degeneration of the spine were generally lower than where degeneration occurred. It should be obvious that stable ligaments equal stable spines – unstable ligaments – unstable spines. 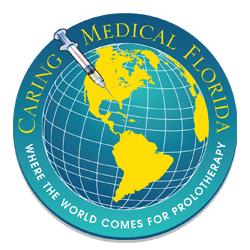 Prolotherapy is an in-office injection treatment that research and medical studies have shown to be an effective, trustworthy, reliable alternative to surgical and non-effective conservative care treatments. In our opinion, based on research and clinical results, H3 Prolotherapy (H3 is a type of Prolotherapy named after three of its leading physician innovators Hemwall-Hackett-Hauser) is superior to many other treatments in relieving the problems of chronic joint and spine pain and, most importantly, in getting people back to a happy and active lifestyle. They concluded their research by suggesting: “There are currently few treatment choices other than surgical fusion for intractable lumbar discogenic pain and instability. 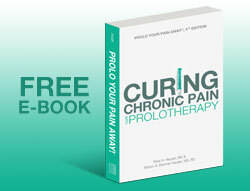 Prolotherapy may offer a minimally invasive, cost effective, and safe management option for these patients. Prolotherapy can provide significant relief of axial pain (soft tissue damage) and tenderness combined with functional improvement, even in “failed back syndrome” patients. Citing our own published research in which we followed 145 patients who had suffered from back pain on average of nearly five years, we examined not only the physical aspect of Prolotherapy, but the mental aspect of treatment as well. 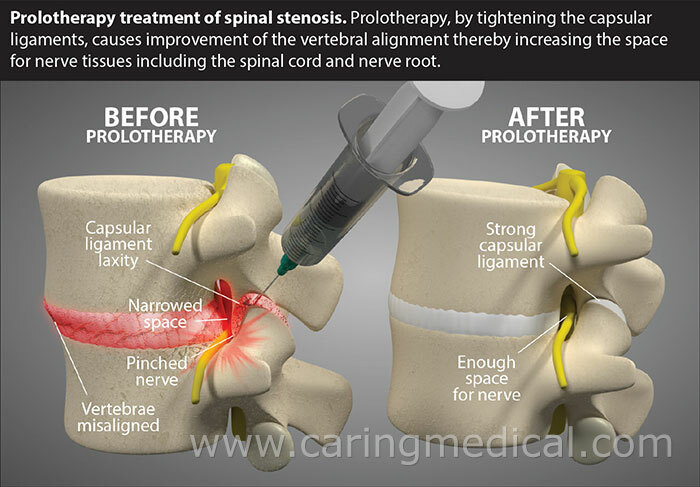 By correcting the instability of the lumbar spine at an early stage, Prolotherapy will cause less stress to be imposed on the disc and less degeneration to occur at the disc. We concluded this research by suggesting that in this study on the use of Prolotherapy, patients with over four years of unresolved low back pain were shown to improve their pain, stiffness, range of motion, and quality of life measures even 12 months subsequent to their last Prolotherapy session. 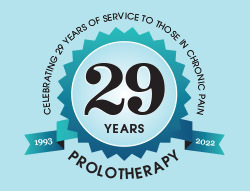 This pilot study shows that Prolotherapy is a treatment that should be considered and further studied for people suffering with unresolved low back pain. It may be difficult for some people to think that Prolotherapy may offer them an option when so many treatments before have failed. It may be hard for some patients to ignore strong recommenders to consider a spinal surgery that may or may not help and may or may not make their situation worse than it is today. Is this treatment right for you? Would you be a good candidate? Ask us.